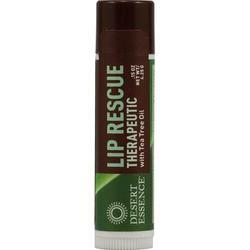 Save on Desert Essence Lip Balm, Tea Tree Oil Rescue (24x.15 OZ). Ingredients include Soybean Oil, Eco-Harvest Tea Tree Oil, Beeswax, Candelilla Wax, Ozokerite, Carnauba, Aloe Vera, Jojoba Oil, Vitamin E, Propyl Gallate. This decriptions is informational only. Please review the actual product for ingredients and suggested serving prior to use.